The old city center of Vienna, is encircled by the handsome Ringstrasse. Emperor Franz Joseph I had the city walls demolished in 1857 and in their place built this boulevard lined with the exquisite buildings that help make Vienna the gorgeous city it is. We stayed just south of the Ring for two nights and in the center for one night. Our train from Graz arrived at the Sudbahnhof mid-afternoon from which we took the "D" tram to Karlsplatz, the intersection of Kartnerstrasse and Kartner Ring. We disembarked and were greeted by the grand Vienna State Opera, a reminder that the most famous composers in the world have lived and worked here. Not only Wolfgang Amadeus Mozart, whose yearlong 250th birthday celebration starts here on January 27, 2006 but Johann Strauss, Franz Schubert, Ludwig Van Beethoven and Joseph Haydn. We walked south on Kartnerstrasse (north would have taken us along the wide shopping boulevard of Kartnerstrasse directly to St. Stephansplatz, the center of the old city), which becomes Wiedner Hauptstrasse, to Frankenbergasse 10 and the Hotel Kaiserhof. Since 1896 eight generations of the same family have operated this splendid old house. Over time it has maintained its grandeur while adding contemporary design elements. Enter the dazzling yellow and white lobby capped by a sculpted, high ceiling to a warm welcome. A cozy seating area leads to a very inviting, contemporary library lounge with bar. The yellow and white theme of the public areas carried through to our spacious king room with fine quality, well chosen furniture, furnishings and bedding. On the counter top of the lovely tiled bathroom was a basket filled with excellent hair and body care products and a few extras goodies. It would be a very comfortable two nights as were the mornings in the lovely breakfast room with a very good buffet and service. The Kaiserhof is located in the 4th district in Freihausviertel. Once a poor neighborhood where the city provided free housing (Freihaus) it has evolved into a desirable place to live and work because it is close to the city center and is still affordable. Streets like Operngasse, Muhlgasse, and Schleifmuhlgasse are filled with trendy and traditional art galleries, home furnishings shops, fashion boutiques, eateries, cafes and food shops. Some of the local favorites that looked pretty good to us where: "The Point of Sale" a coffee shop, "The Breakfast Club" for breakfast and lunch, "Rauminhalt" modern furniture, "Grand Cacao" outrageous chocolates, "Babette's" cookbooks, "Restaurant Muhlbach" trendy restaurant-bar-cafe, "Cafe Anzengruber" traditional, "Altwien" house-roasted coffee, etc. We strolled the streets into the early evening as folks returned from work and began filling up the bars, cafes and restaurants. Freihausviertel is young, fun and full of energy. If you don't move here, visit! The public transportation system is superb with efficient and clean underground, bus and tram service. The 72 hour Vienna Card for 16.90 euro covers it all plus other free entrances and discounts. It's a real bargain. With Vienna Card in hand we zipped over to Burggasse 63 to Restaurant Zu den 2 Lieserln which a friend had recommended. It's small with paneled walls, decorated with a few artifacts. The specialty here is schnitzel. We started with delicious Ottakringer beer and very good Viennese soup (beef broth with pieces of meat, vegetables, noodles and herbs) served hot and hearty. We had the small size (more than enough, even for me!) schnitzel, a thick slice of tender pork lightly battered and fried to a crisp doneness, which was served with a large portion of delectable potato salad. Cost was very reasonable; exceptional value here! A short walk after breakfast and we arrived at the Naschmarkt, uniquely located between the banks (Wienzeile Linke, left and Wienzeile Rechte, right) of the Wien river, roofed during the nineteenth century. 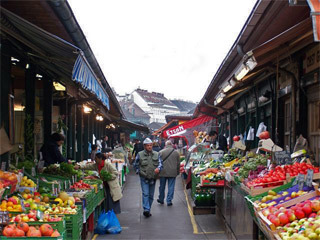 The Naschmarkt, a Viennese institution, is the largest market with a middle eastern influence. Neat stalls sell everything from foods to clothing to household products and there are many cafes, bars and restaurants for a lunch break. Following the demographics of the surrounding area, there seems to be a movement to a bit more upscale and trendy direction for the eating and drinking establishments. For added shopping fun there is a Saturday morning flea market. The offerings were enticing but after our bountiful breakfast, we were able to move on without indulging. We passed Cafe Sperl, one of Vienna's oldest and most famous, and again we were tempted, but there was no sense stopping unless we were prepared to do the Cafe thing, sit for a while sip a coffee and slowly enjoy a sweet, which we were not. Konigsklostergasse brought us to Karl Schweighofergasse and to the five streets between Siebensterngasse and Burgasse that make up the very popular Spittelberg Quarter. After restoration and revitalization of the Baroque buildings, the area is vibrant with colorful narrow streets, randomly linked by alleyways and passageways, a maze of interesting cafes, bars, restaurants and shops neatly integrated with the fine homes. Spittelberg is a neighbor of the MuseumsQuartier Wien, a huge cultural complex dedicated to modern and contemporary art and culture. Originally the Imperial Stables, it became a venue for trade fairs and exhibits and in 2001 was inaugurated as the MuseumsQuartier. The historic buildings were restored and integrated with new contemporary designs creating a spectacular oasis of art, culture, fun and relaxation on a site in the city between the historic Vienna Hofburg Palace, Imperial residence & Palace of art, and the evolving contemporary neighborhoods. It's a brilliant blending of the old and new. This is one of the ten largest cultural complexes in the world with venues for fine and performing arts, music, fashion, theater, architecture, new media and children's culture. The most recent buildings best identify the character of todays MuseumsQuartier. 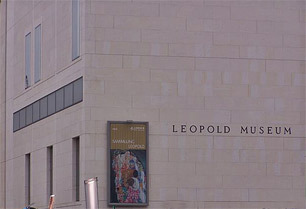 The white limestone Leopold Museum displays the world's largest Schiele collection plus works by Kokoschka, Gerstl, Kubin and others. The Museum of Modern Art Ludwig Foundation of Vienna, a beauty of dark basalt lava, documents the important artistic trends of the twentieth century. The brick new Kunsthalle Wien emphasizes the avant-garde, with changing exhibitions and developments on the international art scene. The Architecture Center Vienna presents exciting contemporary exhibits and in its permanent exhibition features Austrian architecture of the twentieth and twenty-first centuries. Children are treated to creative experiences at the Zoom Childrens Museum and the Dischungel Wien, Theater House for a young audience. Quartier 21 offers space for the presentations and creations of cultural exhibitors, Halls E and G are used for festivals and modern body art of all kinds can be seen at the Tanzquartier Wien. There is an Artist-in-Residence Program that fosters international, project-related exchange financed with the aid of private sponsors. Each year about forty artists from other countries are invited to work on location on joint projects with the resident cultural initiatives. Standing in the enormous lively inner courtyard surrounded by this spectacular marriage of tradition and modern, it was easy to understand why the MuseumsQuartier and its environs has become such a popular destination. When you have satiated your art and culture needs, you can spend hours strolling Mariahilferstrasse, the fabulous mile-long shopping street that starts at the MuseumsQuartier, or take a break at one of the strategically located, beautifully designed cafes, bars or restaurants. At Museumplatz, across the way toward the city center, wonderful Hapsburg buildings house the Kunsthistorisches Museum and the Naturhistorisches Museum. The former contains the largest Bruegel collection in the world plus works of other great masters including Raphael, Rembrandt and Rubens, and the Hapsburgs significant collections of sculpture and decorative arts from Greek, Roman, Egyptian and Near Eastern antiquities. The Museum of Natural History houses treasures from pre-historic to endangered and extinct species. We continued on to Heldenplatz and the magnificent, architecturally exquisite, Hofburg Wein. The Imperial Palace, formerly the center of the vast empire of the Hapsburg dynasty, now houses the offices of the Austrian President and a host of attractions including cafes, restaurants and gardens. There is much to experience here: the Vienna Boys Choir sings mass at the Chapel on Sundays, the Lipizzaner stallions perform at the Spanish Riding School, the private rooms of the Empress Sisi in the Imperial apartments can be visited, as well as more than twenty-four museums. We headed directly to the greenhouse complex of the gardens because we had a tip that there was a new restaurant with very good food in that unique setting. 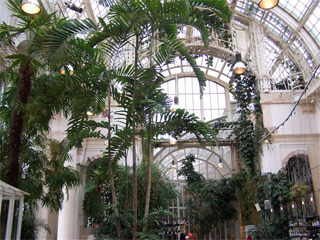 A section of the old greenhouse has been turned into a bright, airy, glorious dining experience. The high, intricately-designed glass roof and windows allows the sunshine to stream in for the trees, vines and plants that grace the open space. The fresh, contemporary design includes a long bar with comfy stools and an open kitchen featuring fresh fish. We decided on salads of beets, fresh grilled tuna and greens from the daily menu and saved our calorie intake for the outrageous desserts we would indulge in later in the afternoon. Walking on Kohlmarkt, one of the city centers premier shopping ways, we stopped in our tracks at #14 in front of Demel, our dessert dream come true. The ancient wood counters and cases display a marvelous selection of pastries and candies. We wandered through rooms of Viennese charm and found a table at the rear near an open kitchen where the chefs performed their magic. After settling in, we returned to the front to make our selections and received a ticket with a number to give to our waitress. Choosing was very difficult because everything looked so wonderful. I had a soft doughy bun filled with fresh plums in an awesome vanilla sauce and Linda a three-layer torte of apples, poppy seeds and plums, and a large side of "the best yet" schlag. The coffee, of course, was excellent. By the way, Demel also offers a contemporary food menu. At the end of Kohlmarkt at Am Graben 19 is Julius Meinl am Graben, one of the finest gourmet food emporiums we have encountered. Starting life in 1862 roasting green coffee beans on the family kitchen stove, it evolved into a retail food empire which was lost after the outbreak of WWII. In 1996 Meinl returned to its roots as a leading supplier of coffees, teas, jams and other fine foods. This posh culinary epicenter was opened in 2000 with three floors of magnificently presented food products from around the world. There is an elegant restaurant on the first floor and a separate seafood bar with stools and stand-up tables. For something lighter there's a ground floor cafe and prepared foods counter. It was a sensual treat just being there. We walked through town back to our hotel for a brief rest before strolling over to Restaurant Waldviertlerhof, Schonbrunnerstrasse 20, for a marvelous traditional Viennese experience. There are many rooms and every one was packed, many with large parties. Busy as it was, our waiter was attentive and helpful. We had sturm for the first time this trip and regretted having waited so long to indulge. (Sturm is delicious, semi-fermented grape juice from the first grape harvest of the season.) Linda had knoedln scrambled with egg, onions and herbs with a mixed salad and I, young deer in a luscious mushroom sauce, a soft and tasty knoedl (that put all others to shame), and cranberry sauce. Perfect from every aspect, including the reasonable prices, Waldviertlerhof is excellent value. Today was moving day. We took the underground to St. Stephansplatz, the heart of the old center walked past St. Stephens cathedral for a short distance on Schulerstrasse to #14, Hotel Domizil, a fabulous city center location. This is a cozy charmer with a friendly, caring staff. The lobby, with reception desk, has a small bar and complimentary internet point. A bountiful breakfast buffet is served in the adjacent pretty breakfast room. Tall double doors opened to our room that exuded homey comfort with a king bed, desk, chairs and a small table. The nicely tiled bathroom with a tub and shower was stocked with the basic necessities. All the furnishings were well chosen and good quality. We made our way over to Judenplatz to the New Museum Judenplatz, an annex of the Jewish Museum Vienna, and the Memorial to the Austrian victims of the Shoah. The idea of the memorial was conceived by Simon Wiesenthal and realized in October 2000. Brilliantly designed by the British sculptress Rachel Whiteread, it has the form of a library turned inside out, the exterior walls in the form of library shelves. Around the bottom of the monument are engraved the names of 65,000 Austrian Jews that were put to death during the Nazi regime. The Memorial is linked to the Information Rooms on the Shoah on the ground floor of the New Museum in the Misrachi house, Judenplatz 8, whose contents have been provided by the Documentation Archives of the Austrian Resistance. The multimedia presentation consists of the names and data of the 65,000 Jews together with the circumstances that led to their persecution and death. The New Museum Judenplatz is made up of three permanent exhibition rooms depicting medieval Jewish life in Vienna and the excavations of the medieval synagogue, one of the largest in Europe, which was discovered in 1995 beneath Judenplatz. A multi-media presentation vividly portrays the religious, cultural, business and social life of the Viennese Jews of the Middle Ages until their expulsion and death in 1420/21 during the "First Vienna Gesera", as it is called. The late medieval synagogue was built around the middle of the 13th century and in the ensuing 150 years, it was enlarged to about 4320 sq.ft. After the pogrom in 1420/21 it was systematically destroyed so that only the foundations and floor remained. The archaeological exhibition room houses the remnants of the synagogue, which consisted of three rooms, before the last enlargement. A few surviving ceramic floor tiles are displayed. The Jewish Museum Vienna, is housed in the Palais Eskeles, Dorotheergasse 11. Remembrance is the key to Jewish culture and it permeates the museum, which is a place of encounter, communication and discussion via symposiums, readings, concerts etc. The permanent exhibitions are supplemented by temporary exhibits on Jewish history, religion and culture. The presentation of Max Berger Judaica collection, dating mostly from the Hapsburg monarchy, explains the function of ritual objects in the Jewish festivals and daily life. New York artist Nancy Spero has interpreted images and texts of the history of Vienna and stamped them on the walls to provide a fresco-like fragment of remembrance that complements the Judaica collection. 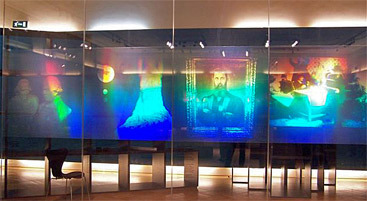 An outstanding hologram presentation depicts the Jewish experience in Vienna from the middle ages to the present. It is an interesting interpretation of Vienna's Jewish history, three-dimensional, yet intangible, as the images appear and disappear as one moves through the gallery. The viewable storage area displays the entire inventory of ritual objects that had been brutally removed from their accustomed places, the households, synagogues and prayer houses, in 1938. The museum archives provide fragmentary excerpts from Jewish life. There was a marvelous temporary exhibit, "Mahleriana, the Making of an Icon", that ends January 8, 2006. This exhibition by the International Gustav Mahler Society documents the Society's commitment to the recognition of Mahler's music. The society has managed to salvage the three composing huts on the Attersee, Woerthersee and in South Tyrol, where Mahler composed his music, and has turned them into memorials to the artist. The significance of the composing huts is a central theme of the exhibition. There is an audio guide of Mahlers music and comments by his family, friends and other musicians. We found fabulous apple strudel at Cafe Diglas, Wollzeile 10. The food being served looked appetizing but we were here with other intentions. The plump strudel with crispy pastry was filled with apples, raisins and nuts and served at room temperature, my favorite way. The coffee was superb. Thank you, call again, member of the apple strudel club! At the beginning of the 19th century the Jewish community of Vienna received permission to build a synagogue under the condition that it would not be seen from the street. So it was that the monumental Stadttempel synagogue was built on Seitenstettengasse from 1824-26 and consecrated on April 9, 1826; Cantor Solomon Sulzer performed a musical arrangement written by Franz Schubert. 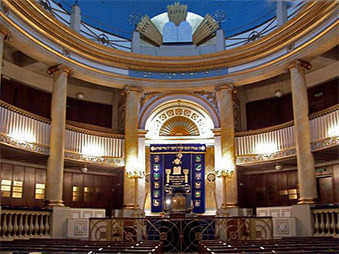 The Neo-Classical design was one of the most innovative in the city and became a model for other synagogues in western Europe. It became the first official Ashkenazi communal synagogue. Two five-storey elongated apartment buildings facing the street concealed the synagogue from view. The building was built in an oval shape with a large umbrella-like dome. Twelve Ionic columns, for the twelve tribes of Israel, support a two-tiered women's gallery. The ceiling was painted sky blue with golden stars. The Bimah was on the east side of the hall and opposite it stood the double level Holy Ark. On top are the Tablets of the Law within a golden sunburst. A memorial to the 65,000 Jews who were murdered has been erected in the foyer. Names are engraved on rotating slate tablets. 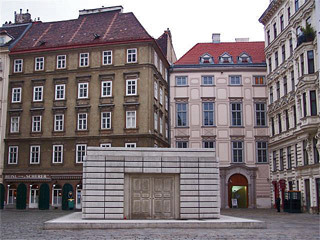 Pieces are broken off the center granite column, symbolizing the destruction of the Jewish community in Vienna in 1938. The interior was only slightly damaged during Kristallnacht. It was repaired in 1945 and rededicated in 1946, its 120th anniversary, with a public prayer in the presence of cabinet ministers. It was declared a historic site and is the central synagogue of the Jewish community of Vienna. We must admit that it was a very good job of concealment because if we did not bump into a security official, we might still be looking for the entrance. 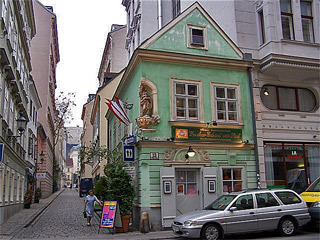 The same friend that recommended last evenings restaurant also suggested Gasthaus Zu Den 3 Hacken, Singerstrasse 28, telephone 512-5895, the oldest tavern in Vienna, a few minutes walk from the Domizil. An enticing green patio leads into a warm neighborhood environment complete with a lovely waitress. Our Scwechater Hofenperie beer won the best beer award, delicious, especially with the yummy, doughy rye pretzel. The beef, vegetable and noodle soup, an old favorite, was excellent. Roast pork with sauerkraut and sautéed liver were both served with wonderful semolina dumplings. This was a splendid, very good value home-style Austrian meal for fond memories of our last dinner of the trip. At Wien-Mitte Bahnhof it is possible to check luggage and get a boarding pass for many airlines from 24 hours to 75 minutes prior to departure. You have to use the CAT, city airport train to use this advance boarding pass/luggage check service. The CAT offers a discount with the Vienna card. A cheaper alternative from Wien-Mitte, is to take the "S" line #7 to the airport for 1.50 euro. The CAT takes about 8 minutes less than the "S" line to the airport. After a substantial breakfast at Hotel Domizil, we wheeled our bags to St. Stephansplatz, took the U3 line to Wien-Mitte, transferred to the "S" line and took #7 to the airport. I had my deer many ways and Linda her share of schnitzel and all the strudel mit schlag we could handle. The mountain air was fresh and the lakes sparkling. The cities and towns were a wonderful world of tradition, bursting with a new energy. Make plans to go - be there to sing Happy Birthday to Mozart!